Valley Journal: Lady Pirate Paige Noyes gets a hit. Good perch fishing on the east bay of Flathead Lake should last into June. As waters warm, the fishing opportunities are on the increase, but some of the best fishing is only temporary. For optimum results there are three area bodies of water that you should plan to fish in the near future. Last Sunday, Roger Smart and I went to Lake Mary Ronan after hearing that the kokanee bite was improving. We arrived at our choice of fishing holes around 9:30 a.m. By 10:30 a.m. we had our two ten-fish limits. Our newest creation we call an “H-wana-B” was incredibly effective along with an inline glow smile hook above it. Raw shrimp again proved to be the most effective bait. Our approach to chumming is to have a gallon bag of rolled corn with a can of corn added for more scent. Intermittently throwing just a pinch of this mixture is adequate. Personally I haven’t seen the salmon fish this fast and furious for about three years. It’s also been years since they were this big. I’d say our largest was close to 14 inches. Fishermen have been reporting nice catches of large “largemouth” bass from Ninepipes Reservoir. A variety of darker plastic baits seemed to work best with the Gary Yamamoto “senko” being at the top of the list. 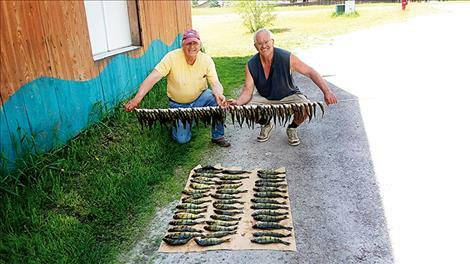 On Tuesday, May 15, my brother Ken and I went on a bait fishing search. After three or four hours of zilch we decided to redeem the day with some perch out in East Bay. With about an hour of daylight remaining we began to catch fish in a 5.7 foot depth directly north of Ducharme Creek. We had a dynamite hour of fishing (see picture) with lots of doubles using 2 hook “smile” and “fuzz bugz” setups. We used mostly nightcrawlers but cut perch was also successful. This bite should last into June. The fishing in all three of the lakes I’ve mentioned will be on the decline as water temperatures increase. It’s not too early to begin to plan for the whitefish and perch fishing in Flathead Lake proper (all the lake north of the narrows). Both of these could kick in by the first week of July. For more information give us a call at 406-675-0068. My personal cell is 406-250-0241. Email us at: macman@ronan.net and check out our website at: www.zimmertackle.com. Good fishing.